Fly to Broome and enjoy a leisurely start to your holiday. Explore the township before retiring to your accommodation for the night. The historic pearling town of Broome lies in the vast and beautiful Kimberley region of Western Australia, this vibrant and cosmopolitan town has a wealth of attractions, soak up sensational Indian Ocean sunsets, take a sunset camel tour on Cable Beach, see Chinatown's exquisite pearl showrooms and see dinosaur footprints at Gantheaume Point. Enjoy a leisurely day before meeting your Travel Director and fellow travellers over a drink and dinner at a Welcome Reception. Immerse yourself in Broome's proud pearling history and heritage on a visit to Pearl Luggers, located in the city's vibrant Chinatown district, see two beautifully restored pearl luggers which contain many fascinating pearl diving artefacts such as diving suits and helmets and take a guided tour and hear stories of the men who risked their lives diving for pearls. Skim the emerald waters and sand bars of Roebuck Bay as you embark on a thrilling hovercraft experience, marvel at Broome's glorious coastline and walk amongst the rusting relics of Dutch Catalina flying boats destroyed in WWII lying 1km offshore, see preserved dinosaur footprints at low tide and gaze in awe at sensational sunsets from remote tidal flats. Breakfast, Luxury Coach Tour with Hotel Pick Up, Optional Excursions, Dinner, Overnight Broome Accommodation. Western Australia's Pilbara region is home to some of the world's most ancient and beautiful landscapes, hundreds of tiny islands with white beaches and pristine coral gardens dot the blue waters of the Dampier Archipelago and the mighty gorges, hidden waterfalls, clear rock pools and deep canyons of Karijini National Park. Breakfast, Karijini National Park Tour, Dinner, Overnight Karijini Accommodation. Breakfast, Karijini National Park Tour, Lunch, Rio Tinto Guided Tour, Dinner, Overnight Karratha Accommodation. The charming town of Exmouth is the ideal hub from which to explore sensational Ningaloo Reef, dive and snorkel its crystal clear waters and swim with giant whale-sharks and manta rays, marvel at the rugged beauty of Cape Range National Park's dramatic gorges, laze on pristine white sand beaches and admire sensational vistas from Vlaming Head Lighthouse. Breakfast, Lunch, Exmouth City Tour, Dinner, Overnight Exmouth Accommodation. The following day, enjoy free time to explore. If nature permits, you may like to view Whale Shark as you swim alongside them in the pristine waters of the Ningaloo Marine Park, alternatively you could take a stroll along the beach, or relax by the hotel pool overlooking the water. Ningaloo Reef on Western Australia's Coral Coast is Australia's largest fringing reef lying just metres from the shore, dive and snorkel its crystal clear waters and marvel at the stunning array of marine life that inhabits them including turtles, clown fish and manta rays, swim with giant whale sharks and idle on secluded white sand beaches. On a shallow draft glass bottom boat, cruise over World Heritage Listed Ningaloo Reef at Coral Bay to see coral formations found in the lagoon gardens of the inner reef. On your one hour coral cruise you'll see wonderful fish and corals without having to get in the water. It's a fantastic experience! Breakfast, Coral Cruise, Dinner, Overnight Carnarvon Accommodation. Exmouth is Western Australia's underwater playground, home to the sensational Ningaloo Reef the largest fringing reef in Australia with its coral gardens and pristine waters which makes it a magnet for divers and snorkellers, Cape Range National Park is blessed with a wealth of rugged natural beauty, towering gorges and deep canyons. Monkey Mia is world renowned as the place where 'you meet the dolphins', every morning a friendly pod of bottlenose dolphins swim to the shallow waters of Monkey Mia to interact with visitors who may get the chance to hand feed these engaging creatures in an unforgettable encounter which offers one of the world's great wildlife experiences. Breakfast, Monkey Mia Dolphin Interaction (Not Guaranteed), Overnight Monkey Mia Accommodation. Laid-back Kalbarri is blessed with ruggedly beautiful coastline, sheltered swimming bays and dramatic gorges, Kalbarri's coastal waters are ideal for surfing and fishing, towering cliffs offer great vantage points for whale spotting in season, nearby Kalbarri National Park offers sensational lookouts and a wealth of walking and hiking trails. The eerie ancient rock spires of the Pinnacles lie in Nambung National Park three hours drive north of Perth, these amazing natural limestone structures are a major attraction attracting more than 190,000 visitors a year to the park which lies just outside the coastal town of Cervantes, a visit to the Pinnacles Desert Discovery Centre is a must do. Travel to Nambung National Park and visit the Pinnacles Desert before stopping at Lancelin. Continue to Yanchep National Park and enjoy an Aboriginal experience complete with touching traditional Aboriginal tools. Continue to Perth for dinner and your overnight accommodation. Breakfast, Pinnacles National Park Tour, Yanchep National Park Tour, Dinner, Overnight Perth Accommodation. Perth is Western Australia's friendly and sunny capital city, it's heartbeat is the beautiful Swan River which meanders its way through the city, Perth is cosmopolitan, vibrant and modern with plenty to see and do, admire its modern cityscape from scenic Matilda Bay and sensational Kings Park, idle on shimmering white sand beaches and dine in world class restaurants. Enjoy a day of leisure in Perth. Rottnest Island lies just 19 km off the coast of Perth, this paradisiacal island is a favourite playground for locals and visitors alike, blessed with a laid back atmosphere, beautiful beaches, shimmering waters teeming with marine life and pristine swimming bays, climb the Wadjemup Lighthouse for sensational views and spot for friendly quokkas. Explore the beautiful sights of Rottnest Island in air conditioned comfort! Take in the historical, cultural and natural interest points of Rottnest Island, complete with lunch. See below for full details on your Indian Pacific journey. 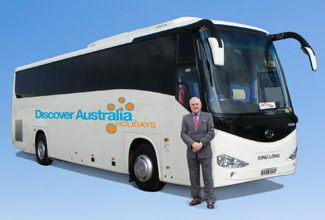 Note: passengers disembarking in Adelaide leave on Day 22. 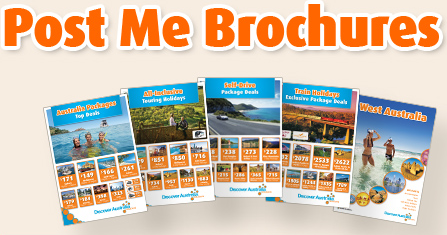 You have 3 choices of accommodation in Perth and Broome. Our "Good Standard" central Perth & Broome hotels have great facilities, a comfortable room and friendly service (typically 3.5 stars). Alternatively, why not treat yourself? The "Deluxe" hotels have superior facilities, stylish rooms and first class service (typically 4 stars). The “Luxury” hotels are upscale with a more luxurious feel for the discerning traveller and great for celebrating an anniversary (typically 5 stars). You will be transferred on arrival in Broome from the airport to your hotel and from your hotel in Perth to the railway station for your Indian Pacific journey to Sydney. You will be personally met by a DISCOVER AUSTRALIA representative on arrival in Sydney and be transferred to the airport to meet your flight home. 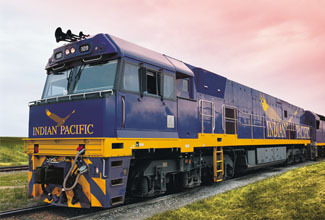 The Indian Pacific with West Coast & Broome Luxury Touring is very popular. Many dates book out well in advance, please book soon.